This entry was posted in ARC Picks Past Events on February 3, 2015 by Lauren Pearson. 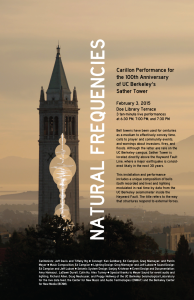 A new media Carillon installation and performance in honor of the 100th Anniversary of UC Berkeley’s Sather Tower (the Campanile). Bell towers have been used for centuries as a medium to convey time effectively, calls to prayer and community events, and warnings about invasions, fires, and floods. Although the latter are rare on the UC Berkeley campus, Sather Tower is located directly above the Hayward Fault Line, where a major earthquake is considered likely in the next 30 years. 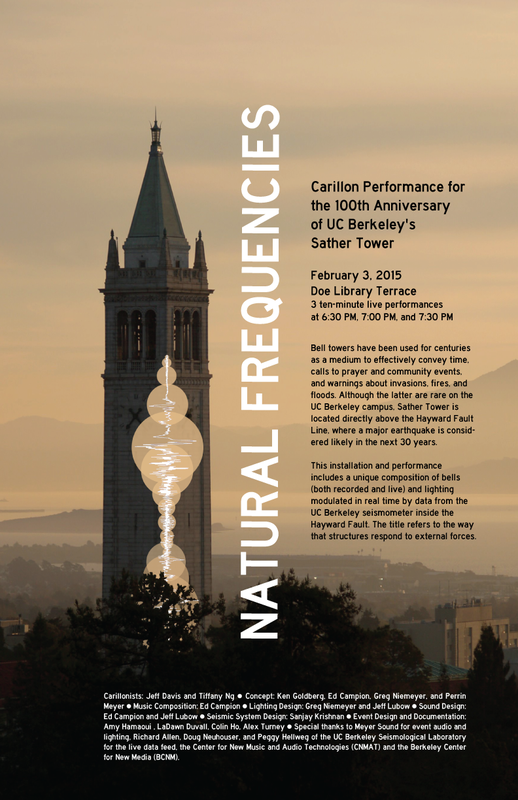 This installation and performance includes a unique composition of bells (both recorded and live) and lighting modulated in real time by data from the UC Berkeley seismometer inside the Hayward Fault. The title refers to the response of structures and systems to external forces.